"You're mine now, forever...and I'm so happy!" 1980 saw the release of Friday the 13th which, as we all know, went on into film history (for reasons I doubt any of us understand). The early 80's were a trove of slasher films, some good, most bad. When I was about 12 years old, I came across William Lustig's Maniac, presuming it to be yet another great "popcorn" horror film. Though I was mostly right, the film turned out to be a unique, bright spot in the slasher genre that avoided many of the common pitfalls. Maniac was also the pet project of late actor Joe Spinell, the fantastic character actor who was used to great (if short-lived) effect in films like Godfather Part II and Taxi Driver. Spinell wrote, co-produced, and starred in Maniac; his utter devotion to make a film about a deranged serial killer drove him here. Joe Spinell portrays Frank Zito, a psychologically disturbed loner. Frank kills women, seemingly at random, then scalps them. He attaches the scalps to mannequins that he lives with in his cramped, dark basement apartment. Though capable of short periods of sanity, for the most part Frank is completely psychotic, often talking to himself or to the mannequins. He obviously is attempting to embody these mannequins with the qualities of someone he once loved, but he also imagines that these fake women in his apartment are encouraging him to kill. Eventually, Frank's trail of senseless violence leads to a charming female photographer (Caroline Munro), but despite the hope of a somewhat normal relationship with her, Frank still can't contain his sickness. Maniac is a dark horror film, make no mistake about that, but it contains a level of depth usually not found in American slasher movies from this era. Joe Spinell's devoted performance is truly the core of the film. He manages to be disturbingly effective as the murderous Frank, and becomes a believable villain. In the same way that Anthony Perkins made Norman Bates jump off the screen, Joe Spinell can be proud of his obsessive research for the role as it made him that much scarier. The film is pretty violent, and viewers should be warned. Weak stomachs will not survive this film, thanks to the typically ghoulish effects by Tom Savini (who had just completed work on Dawn of the Dead). Also worthy of mention is the fact that this DVD edition is the so-called "director's cut." Fans of the film will notice one small cut made to the film that William Lustig felt made the whole thing more unusual and mysterious. Thankfully, he was right. Image Transfer Review: Maniac is presented in it's original 1:85:1 aspect ratio. The source print is a bit on the grainy side, but colors look good and there's good black level detail. The film certainly looks much better here than it ever has before, despite the grain and some compression artifacts. There is a rather high bitrate as well (about 8 mbps) indicating a thought-out transfer. This disc wouldn't make a good demo or anything like that, but it lessens all of the problems with the VHS copies and restores the film to probably what it looked like back in 1980. I can't give it a hearty thumbs up, but I can't tear it down either. I think Elite did the best they could have. Audio Transfer Review: While I appreciate the engineering Elite did to make the new Dolby 5.1 soundtrack, I honestly wonder what the point was. 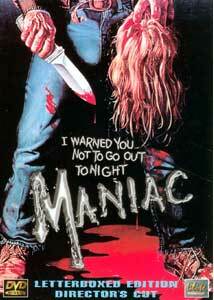 Maniac doesn't have a whole lot of action to warrant a surround mix. Regardless, the 5.1 mix is done very well. The music is transformed into a very scary, crisp version of what it used to be, and many sound effects get new directionality. Dialogue unfortunately remains about as muddy and muffled as it was in the original mono, but the surrounds get used for some ambient noise. The new track is certainly an improvement, but it's not terribly amazing or anything. The 2.0 audio is, for the most part, a Pro-Logic Mono mix. Extras Review: The largest feature here is the conversive commentary track by director William Lustig, actor/FX artist Tom Savini, editor Lorenzo Martinelli, and Luke Walter who was assistant to Joe Spinell. The track is a nice, laid-back, commentary with all the individuals discussing their memories of making the film. More importantly, is the conversation remembering actor Joe Spinell. There are numerous original trailers from different countries, but perhaps the most important addition is the legendary, hard-to-find trailer promo for Maniac 2: Mister Robbie. The promo was created, but sadly the film never actually got made. In the film, Joe Spinell was to play "Mister Robbie", a television children's show host with the same mental problems as the character in Maniac. Also included is the deleted scene that was taken out of the film at William Lustig's request. The disc is rounded off with cast and crew bios that are well written and fairly exhaustive. The keepcase insert is a one sheet listing of the chapter stops with a short comment from William Lustig about Joe Spinell. Maniac isn't really a grand masterpiece, but it has a sense of what it wants to be. It's disturbing, gory, and fits the bill of a true horror film quite well. I can definitely recommend it to anyone who misses the old days of quality slasher flicks.